Vaccines are still necessary and still the ounce of prevention that save us from pounds of cure. Pounds, I might add, that don’t always work. Evidence? Ten unimmunized infants, all younger than 3 months of age, died from whooping cough in California last year. As I write this we have 156 confirmed cases of measles in the U.S. this year and half of them have been hospitalized because of it. That’s the most cases since 1996 and we haven’t even reached the halfway point in 2011. Read the full blog post here on Huffington Post. So many parents are having a difficult time with this question. For me and my family, it’s a no-brainer. 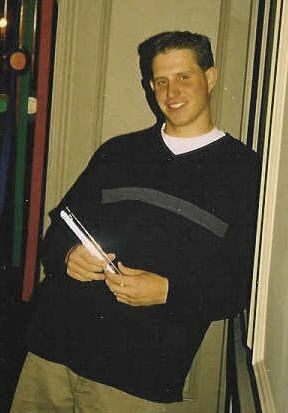 We lost our college-aged son 13 years ago to bacterial meningitis, because we did not know that a vaccine existed or was available. Had we known, our son would have been vaccinated and would be alive today. Can I go back and rewind the tape on these last 13 years? Can I start over again? Why didn’t I know about this vaccine, when so many other vaccines were listed on my son’s college-admission forms? Parents with children today are so lucky, compared to our parents and grandparents. Vaccines are medical miracles that have transformed the face of medicine. Diseases like polio, measles, rubella and pertussis that once killed or maimed hundreds of thousands of children have been dramatically reduced or eliminated through widespread use of immunizations. As a result, the United States has successfully conquered many of the most challenging infectious childhood diseases, regardless of families’ socioeconomic status. However, we can’t let down our guard. Diseases can make a comeback if people are neglectful about vaccinating based on an assumption that their children will be fine because everyone else is vaccinated. It’s important for everyone to participate in vaccination programs. We must keep protecting our children with vaccinations. Vaccines save lives. The meningitis vaccine could have saved my son’s life. My son was a 20 year old college junior – honor student, pre-med, and pitcher on his college baseball team. He was healthy, happy, and living his dream. Would he have made it to medical school and become a doctor? I think so, as his younger brother did, and their dream was topractice medicine together. Would he have made it to MLB as a pitcher? Who knows? He had a wicked fastball, but that’s not what’s important. What is important is what he was – a wonderful son and brother, who was loved more than I can even put into words, and he will be missed forever. I can’t even begin to describe what life is like after you lose a child, and then to be devastated all over again when you find out that your son didn’t have to die. There is no such thing as “closure” after losing a child. You might not cry as much as you did in the beginning, but that hole in the heart will never heal. You now live a different type of “normal,” one where there can be much joy from other children and grandchildren, but a life with a background sadness that never goes away. You walk down the street and see people laughing, joking, having a great time. For that parent who has lost a child, that will never be you. There is just too much pain and emptiness to be carefree. Vaccines save lives and protect our children. I have confidence in the FDA regulation process that if a vaccine is licensed, it is safe. I don’t understand parents who question the advice of the CDC and our country’s most brilliant children’s advocates. I don’t want any other parent to be me, a mom who lost a child to a vaccine-preventable disease. So, to vaccinate or not to vaccinate …. You shouldn’t have to even think about the answer. Parents Who Protect. I am proud to be a Parent Who Protects. I loved my children in my dreams, even before they were born. I did all of the things new parents do – read the baby how-to books, took my kids in for their doctor’s visits, took them to baseball, basketball, and soccer practices. They each got a “thousand kissies” before they fell asleep at night. The years flew by way too fast, and I wouldn’t change one sleep-deprived moment for anything! Being a mom while my kids were growing up were the best years of my life. I wouldn’t have become a parent if I didn’t want to Protect my Children. Being a parent means you have a responsibility to keep your children safe, teach them right from wrong, and grow up to be happy and healthy. You take it for granted that your child won’t get hit by a car, get a terrible illness, that every life event will just fall into place. Maybe that’s the way I was, and I breathed a sigh of relief when my children started college, thinking that we had gotten through anything bad that could happen. Then I was struck by a word that will haunt me until the day I die. Meningitis, which took the life of my beautiful 20 year old son. I’ll talk more about that in another blog. But, it made my eyes open up to how vulnerable our children really are, and that you can’t go through life with blinders on, thinking that tragedy will strike someone else and not your family. I want parents to teach their children good nutrition habits, to use sunscreen, to wear helmets when riding bikes, and the list can go on and on. I want parents to love their children unconditionally and live each day with them to the fullest, because before you know it, those children will be out of the house. Most of all, I want PARENTS TO PROTECT their children with the best the medical community has to offer, and that includes vaccinating your children against all potentially vaccine-preventable diseases. Being a parent is a gift. But with that gift comes the responsibility to protect. I hope that you will join me as a PARENT WHO PROTECTS.